Welcome, this is my photoblog. A proper portfolio can be found here. I write about life and art on Heading East. Downtown . Downtown Zoige . A Balloon Man . Self Portrait with Bus . Girl at Bus Station . Guesthouse Washroom . Trading Post . The Long Road . Arnold . Tibetan Restaurant . Afternoon at the Hui Restaurant . Amchok Village . Coral . Photostudio . Zoige School . Interior . Argument . Town Visit . General Store Exterior . Busy Eating . Cards . Resting . Road From Zoige . Headmaster Many Years Later . Pool . monks quarters . Brothers . Primary School Teacher . Snowy Morning . Toy Gun . Posing . Sending Son Off to the Monastery . Far Away . The Tiger . The Tiger Arrives . Circumambulating . Tiger Festival 2 . Tiger Festival . the smallest thing . Zoige School . Zoige Studio . Zoige Restaurant . Stuck . Headmaster . Morning Prayer . Marbles . Marking Sheep . Homegod Ceremony 2 . I have nothing . Break for Tea . Snow Leopard Restaurant . On the Bus . Saying Goodbye . Tired . Dust Storm . The Photostudio . Mother and Child . Nomad School . Truck . Baby . Break from House Raising . Chorten . Mr. Pringles . Home God Ceremony . Fresh Kill . Girl With Abacus . Near Aba . Warning . Photostudio . The Headmaster's Wife . Long Voyage . Little Monk . Father & Son . On The Bus . Jungle Reclaimed . Temple . Faces of the Dead . Buddha Roots . shrine at the killing fields . to the killing fields . Cows . Photostudio, Linxia . Limbo . Wedding Palace 2 . Picnic . Chinese Madrasa 3 . Students at Chinese Madrasa . Chinese Madrasa . Chinese "Anmo" House, Garze . Traveling Sideshow . New China, Xining . Old Friends, Kunming . Girl Watching Goldfish . Smokers . Bubbles . Falling Short . Zed Creek Road . Gobbler's Knob Road . New Life Baptist . Rugs . My World, My Game . K&M Game Room . Parking Lot . Summer Sno . Going Fishing . Prayer Tabernacle . Kosina's Country Market . East Texas Pride . Moscow Tattoo . Game Room . Mr. Horsley . Road out of Garze . Night Light . Insomnia . Raul Ascending Staircase . Video Stills . Tia Olivia's Quinceanera . Dad, Broadway and 44th . Dad, 1964 . Haraboji . Jenn's grandmother and her children . Vietnam, Jan 15, 1967 . Dad, Broadway & 44th, 1964 . Airport Monterrey, 1967 . Tio Raul & Tia Elva with guns . My Dad in Paras, 1950's . My Parents, "1/30/1966 Broadway" & 7/27/1965 . Mom, Cuernavaca 1968 . Mama Juela . Yun Wedding . Kunimo's Wedding Photo . Jenn's Dad 1976 . Father & Son . On the bus . On The Bus . Mao Above All . Pause . General Store . Waiting for Breakfast, Jinchuan . Morning Routine . Peach Festival . Before the Loggers . Strange Foreigner . Balloon Man . Untitled . woodsman . Balloon Man #2 . Bus Station . Rebuildiing . Before the Rain . Restaurant Interior . Monastery Trek . Night Noodles . Red Truck . Convent Phone . Handshake . Logging Camp . Upstream . Polaroids (alternate) . Photostudio, Garze . City Walls . Game Interrupted . The Wait . Journey Begins . Nuns Recounting a Fight . Nun Waiting Out Rain . Woodcutter Monks & a Nun . Movie House . Kham Homes . Kham Landscape . Fast Asleep . Horse Trading . Photostudio, Garze . Workers . At the Horse Festival . Watching the Shoe Man . Chatting . Hanging Out . knife and saddle cover shop . pork . yak . 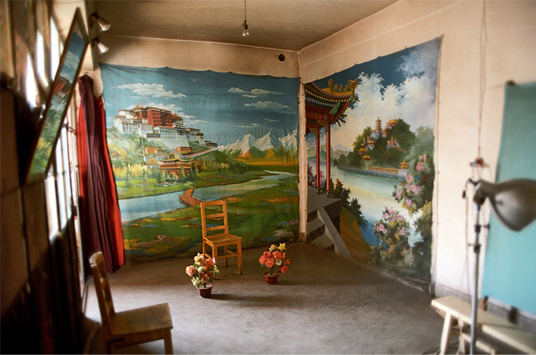 Photostudio, Litang #3 . Photostudio, Litang #2 . Photostudio, Litang . Phone Center . Spooked . Kite . Fancy Bar, Garze . Monastery . At The Studio . The Nun's Room Detail . The Nun's Room . Photostudio Images (from local Tibetan phtographer) . Meat . Funeral Party . Grocery Run . Negotiation . Chinese Settler Housing . Palms . Palms, Truck . Television Opera . Untitled . High Pass . Before the Storm . yak for dinner . Prayer Flags & Dri . Prayer Flags . General Store, Serta . Hearts . Watermelon, Baima . Restaurant near Manigango . Khampa Saddle Maker . Khampa Yak Herder . Khampa Scribe . Dice Game . Balloon Game . Posing . Khampa Tent . Family Wealth . Khampa Food . Flower Festival, Small Cowboy . Flower Festival, The Faithful . Flower Festival, The Scene . Girl in Red Dress, Flower Festival . Family, Nogmoon Villages . Heading out to Pasture, Nogmoon Villages . Summer Camp, Parting Gift . Summer Camp, Parting Gift II . Summer Camp, Interior . Summer Camp, Exterior . Summer Camp, Distance . Making Tea . Goat Herders . Prayer Store . Mushroom Vendors . Field Workers . Near Zongbacha (Rongbatsa) . Monkey Mask . Father & Eldest Daughter . Brothers . Brothers . Festival Near Serxu . Photostudio, Pelyul . Photostudio, Dege . Bookstore . Wandering Monk . Father & Son II, Litang . City Kids . Dice Man . Father & Son, Litang . Binoculars . Boots . Novices at Morning Prayer . Girl with White Balloon . Kite at Dusk . Skins . My Ride to Dahebian . Tailor . Blacksmith . Bookstore . Lunch . Monastery Kitchen . Photostudio2, Litang . Festival Tent . Litang Disco . Small But Fierce . Deep Negotiation . Sisters . Rabbits . Rest . In From the Range . Getting Wired . Carnival Barker . Pouring Tea . Photostudio, Litang . discipline . Tiger Box 1 . Tiger Box 2 . Street Litang . Chinese School . Market, Litang . Flower Barker . Punk Rock by Nature . Confirmation 2 . Mi Luz, Mi Vida II . Holograms . Monos Horribles . Confirmation Dress . Tiberio . outside the church . morning . soy el jefe . luchadores . patas de aguila . Mi Luz, Mi Vida . The Cuban . Double Happiness . The Lee Family . Old Country . The German . Fireworks . 4th of July . The Fog . Summer . Balthazar . My New York . Untitled . scary lady . Goodnight . Right Before it Got Really Bad . Muharram . Muharram2 . Pasu Glacier . Juice Stand . RPG, Darra . Stop on the Road to Darra . On the Road to Darra . Tea Vendors 9 . Tea Vendors . Mountain at Pasu . Pakistani TV . Ritual, Peshawar . Horse . Friday Night . Butterfly Room . Night Fishing . After the Wave . River . Coney Island . Train . Tiny Bubbles . The Day is Done (1 of 4) . Travels Without Maps . Prado Largo . Familia . Grover Cleveland Service Plaza . Urban Explorer . Butterfly Room . The Ride Home . Self Portrait, State Street . Shadow Pictures . White on White . Mother & Child . 15 Years . big, but small . our bear . 3.5 Months . Dec 7, 2004, 10 Seconds . Jenn in Bloom . January 13, 2003 . ahhh... Italy . Photostudio, Garze . Photostudio, Linxia . Photostudio2, Litang . Found Photos . Photostudio, Dege . Open Air Photostudio . Photostudio, Litang . Zoige Studio . Found Photos . The Photostudio . Photostudio . Photostudio . First . Coney Island cliches . Los Angeles . Amarillo . long drive . 15 Years . DUMBO Walk 1 . New Mexico, driving east at dusk . Titanic . Interior . Mal Ojo . Politicos . Sugarcane . Tarea . Regalos en General . Calle 12 . Lydia y Alfonso . Antes . Funeral de Ramon Ortiz . Funeral de Ramon Ortiz . Zapateros . Iglesia Noche . Metodistas . Salon Chi Chi . Mascara Azul . Ayuda Spiritual . Bus From Songpan . Visiting Monks . Brothers . School . Father and daughter . VP OK . Waiting for the Bus Repair . Shoe Store . Waiting for a Permit . Landlocked . Horse Balloon . Fourth of July . Fourth of July . Fourth of July . Happy 2006 . Man on the Street . Happy . Lady Asleep . West 20th . Gypsy Van . Markita . Bautista . Trust Me . Crash . Small Things . Night Boat . He Got His . Ho Chi Minh Masoleum, Hanoi . Wrapped . Ear Cleaner . Morning, Cao Bang . off to school . Long Bus Ride . Caobang Bus . Son La . Shadow of Former Self . Son La Market . Ho Chi Min Birthday Celebration . Open Air Photostudio . after school #2, St. Joseph's, Hanoi . after school #3 . trucker . Fresh . Vietnamese Kids near the Cambodian Border Crossing . Walking Home . After School, Hanoi . Motorcycle Trip 2 . Motorcycle Trip . Bus to Son La . Studio . Morning . At The Ho Chi Min Guesthouse, Son La . Covering Hendrix in Vietnamese . Near Son La . Reception Line . Ho Chi Min Birthday Tent #19 . Ho Chi Min Birthday Tent #13 . Ho Chi Min Birthday Tent . Classroom (alt), Hotan . Classroom, Hotan . Policeman at the Market . Out There . Pigeon Vendor . Teachers Meeting, Hotan . Onion Man . Dusk, outside Kashgar . at the movies . Crutches . Outside Kashgar . Old City, Kashgar . The Perfect Blue . Kashgar Kids at Dusk . The Fights . Girl in red . Meatmen, Hotan . Muslim kids at play . Setting up the studio . Man At the Market . Girl at the Market . Making Dumplings . Waiting Room . Xinjiang Air . Boy with 2 Goats . Father and his Three Sons . The Scene, Kashgar . Shooting Pool . Jumping Rope . The Dentist . Summer Market . Wood Workers, Nur . Dentist 2 . The Bread Men . Summer Market . Street Artist . Giant . Safety First . Chili Man . Red Shoes . Tourist . Medicine . Medicine 2 . Medicine Show . Night, Kashgar . Purple Pants . The Transaction . Near Tashgorkan . Barber . Surrounded in the Old City . Teacher . Kamernisa Washes the Dishes . Always Something Good to Eat on Dumpling Street . Otkur's House . Small Feet . Tetris Break . Game . On the Road to Hotan . Water Boy . Dumpling Street #3 . Motorcycle Taxis . Rasheet's Wife . Rasheet's Yurt . Bootay & Bootay's Wife . The Taklamakan . Bus . The Hunchback . Stranger in the Courtyard . Primary School, Khotan . Man and Goat, Khotan Road . Girl In Red . Untitled . Dumpling Street . The Chili Man . Young Cowboys . Old City, Kashgar . Photostudio . Number 5, Number 4 . Men of Business . Karakorham Highway . Houseraising . Logging Camp 2 . Ladies and Umbrellas . Test of Strength . Man on the Road . the road is long . 10:33 PM . Mother and Daughter . On the Road . Computer Room . Buddha Hands . Manigango . Lone Horseman . Pool Hall, Morning . morning on the bus . Lost . Downtown Sershul . Near Sershul . Waiting for Water . Truckstop . New Lines . Brothers In Law . Brothers In Law . Endless . Truckers . Traffic, Road to Xiewu . Xiewu . Another day, another bus . Trucker's Lounge . rmo mo (grandmother) . Negotiation Interrupted, Downtown Yushu . Photographed . Strange Foreigner . Muslim Restaurant, Maduo . Chinese Truckers . high pass . prayers . Nomads . best restaurant in Yushu . no bus between Xiewu and Serxu . Travel Buddies . Guest House . Rock Breakers . Kitchen . Shepherd Camp . Drum Room . Young Monk Carrying Religious Texts . Chorten At Pass . Village Arrival . Pilgrims . Thin Air . On Pilgrimage . Fields of Barley . Mountain Path . Village . Threshing Barley . Zanskari Toys . Zanskari Girl . Phuctal . Fellow Travelers . Butter Sculptor . Carrying Little Sister .